The Chickens are coming Pt.IV – What breed of chicken? In our journey into keeping chickens I’ve looked at why keep chickens, where to site your coop and the building of the coop structure. Today I’ll look at the breed of chicken that we went for. Like many farm animals, chicken breeding has favoured those that are high yielding for intensive farming methods, which is not surprising given this is where most of the demand comes from. However for those looking for backyard chickens, these breeds are not always the best. Yes they may produce large numbers of eggs, but there are other factors to consider. How family friendly a chicken is was a factor I looked at when I made my choice. Many chicken breeds don’t like to be handled which can be difficult with small children. We made sure our chickens were from a calmer breed. Bantam chickens are supposed to be good in this way, but I felt the eggs were too small with bantams. I also feel that backyard gardeners and smallholders have a responsibility to support genetic diversity, whether that be in choosing vegetables, fruit or livestock. This to me is another reason to choose chicken breeds other than the factory stock birds. So bearing all these points in mind we decided to go for a breed known as a Barnevelder. They are a medium sized chicken breed originally from Holland that are fairly tolerant of being handled. When they do lay (and ours were slow to get going as they were moulting when we got them) they lay a medium sized egg, up to one per day. So let me know, what chicken breed(s) have you tried? What were the good and bad points of them? Would you recommend them? Thanks! When building your chicken coop I suppose you have several options. The first choice I think you need to make is how many chickens you plan to keep. Many councils limit the number that can have in suburban areas to 6 hens. Any more than that and you are probably beyond the scope of this article. Once you have determined the number of hens you are going to keep, then you really need to decide whether you are going to have a mobile coop or a fixed one. I have already shown my decision, a fixed coop, in a post here, but for the benefit of readers I’ll run through some of the reasons why you might chose either. 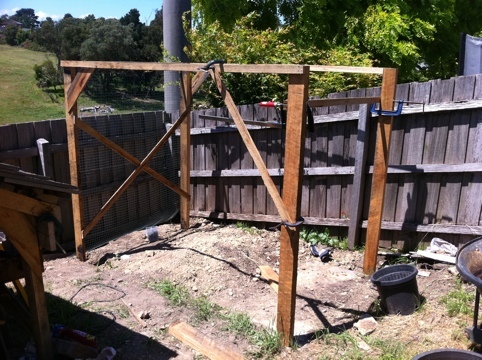 One of the chicken coop posts in place. Mobile chicken coops have many benefits if you aren’t able to let your chickens roam free. You can move the hen house to various locations around your garden enabling them to graze on different areas, improving their nutrition and giving some of the benefits of free-ranging. Mobile coops are often also cheaper to build or buy. Fixed coops on the other hand are more of an undertaking. They do limit you in that unless you let the chickens out they will be stuck in the one spot, but I have found that it is easy enough to put up some temporary fencing and let the chickens run free where I need them (such as turning over the vegie garden). Fixed hen houses can potentially cost more to build, or on the other hand they may be cheaper. As mobile coops are constantly being moved and bumped about their construction needs to be extra sturdy which limits the chance to use mixed or recycled materials. With a fixed chicken coop as long as you aren’t too fussy about the appearance you can incorporate many different materials in the construction, much of which can be recycled. I constructed my coop out of hardwood timber and welded mesh. For the roof I used some sheet metal that I had lying around. continue reading.. The chickens are coming Pt II – the coop site. The site for the chicken coop. Preparations for the chickens have begun apace. During the summertime I have some extra time off as some of the work I do corresponds with the academic year. 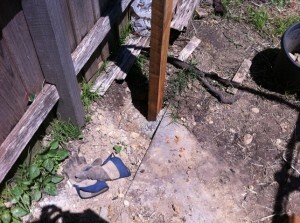 As a result I usually like to undertake some kind of project around the house and yard. This year it is the chickens. I started of course with their coop. I started with selecting the spot. In many respects the spot had been chosen for me – I don’t have many free areas left in the garden large enough to accommodate the coop. But it also turned out that this spot was suited to siting a coop. Big enough, dry, far enough from neighbour’s bedrooms, level enough and not ground that lent itself easily to other uses. If you are a backyard gardener like myself, you will know that the modern suburban plot presents challenges in its small size. When setting out your plot (or making it up as you go along) there is a constant battle around what to put where. 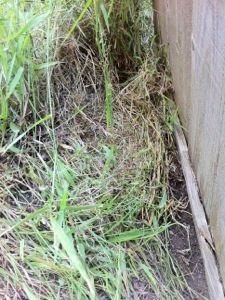 The particular spot where the coop was going had been a problem for years. The soil was too poor to plant much, and making it fertile was too much of a challenge for me. It was also very dry. Our block is sloping and in this area any moisture drains away quickly. So by default it got left. Now when it came to putting chickens on the area many of the negatives became positives. Dry soil is a good idea for a coop. Too much moisture can lead to foot diseases in chickens. I can’t see that being a problem here. That excessive drainage suddenly became desirable. continue reading..
Shhh, the chickens are coming, Pt I – The Reasons. I’ve been wanting to get chickens into the garden for some time now and the time has come to take some action. The reasons for getting chickens are many and before I launch into my series of posts on setting up and actually getting them, I’ll cover some of the reasons why you would want them in your backyard plot. Firstly chickens add another layer of productivity to the garden. Permaculture maintains that the inclusion of animals in the productive space is necessary to create a more natural ecosystem. I’m not an obsessive permaculture fan but I do subscribe to their theory on the need to include livestock. Unfortunately I don’t have the space to include pigs and the like and living in a metropolitan area they can’t be included without Council approval, but chickens don’t take much space, and you can have several without needing to involve the bureaucracy. 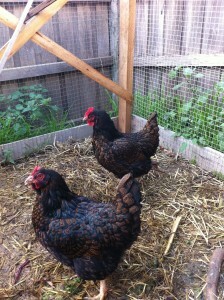 Chickens can also be used for pest reduction in the garden. When a vegetable area has finished its productive spell at the end of the season, fence that area off (so the chickens don’t wreck the rest of the garden) and put the chickens in there to scratch over the soil and eat any remaining insect pests. In the process they’ll also fertilize the soil and start loosening up the soil as well. Your garden will benefit and the chickens will benefit from the extra insects in their diets. Just don’t forget to return them to their coop in the evening! Initially when looking at getting chickens I was a little disappointed with the possible loss of vegetable scraps into the compost, as they would go to the chickens instead. Like all gardeners I love to be able to get my hands on as much compost as possible and anything that looks like it will reduce it tends to meet with resistance from me. However I think the opposite will be the case. I plan to use straw in the base of the coop and the pre-fertilized carbon rich material will add to the compost beautifully. My compost tends to be too nitrogen rich generally due to the grass clippings from the lawn, so adding the straw should balance it and bulk it out well. My last reason for including chickens is that they add a beautiful ambiance to the garden. Which I think is reason enough. Do you have any other thoughts? Reasons that I may have missed? Let me know by posting a comment below.